From Cassandre to Andy Warhol: When Are Vintage Posters Truly Valuable? | What is it worth? Posters have been popular among history collectors for years. These collectors search the internet and collectors fairs on and off for that particular poster that will complete their collection, but how do you know if a poster is valuable not only for you but other collectors as well. We asked Arjan den Boer, poster expert at Catawiki, for advice on which aspects a poster is estimated to the determine its value for now and in the future. It’s too easy to say: the older the poster, the higher its value. But, this can be said with absolute certainty about posters from the Belle Époque (late 19th and early 20th century) and the period between the first and second world wars. Posters from this period are highly sought after collector’s items and often have a high value. These periods are therefore seen as the ‘Golden Age’ of poster art. 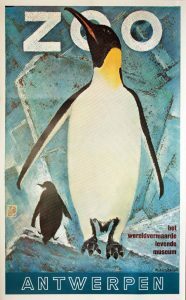 Over the past few years, the ‘mid-century’ posters (1950s/1960s) have also gained in popularity and value. Even though recent posters by well-known designers can yield high revenues, these are only exceptions. ‘Real’ posters are lithographs. This skilful printing technique ensures sharp lines, level planes and vibrant colours. For each colour, a different ink is used. The more recent, cheaper offset printing techniques can also yield good results, but if a four colour grid is used, the result is often not as sharp as the lithograph. Even if a poster is old or special, if it is heavily foxed, folded or damaged, its value will decrease significantly. This is certainly the case when parts are missing, the poster is torn or if it contains large stains. If a poster is still fully intact, it will be deemed in mint condition or condition A. When a poster is damaged, it will be deemed as condition B, and condition C if the damage is major. This may result in a decreased value of up to 50%. Even though posters are mass products, of which multiple exist or have existed, we do speak of originals: the first edition of the production. Later reprints in authentic printing techniques (lithography or screen prints) by the original printer or publisher, or by a renowned institute such as a museum, are also valued, but much less than the original posters. Cheap reproductions from a recent date, which have been mass produced, such as a digital print, don’t have any value for a collector. Although posters from unknown designers can yield high revenues, a famous designer is very important. 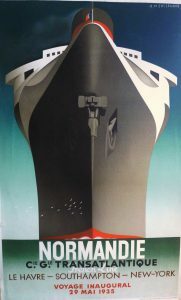 Original posters by the French grandmaster Cassandre for instance yield thousands of euros in revenue. Apart from renowned graphic designers, posters from well-known painters and artists, e.g. 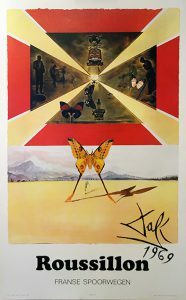 Salvador Dalì or Andy Warhol, or photos from famous photographers are also popular. The last and most important factor is whether collectors find a poster attractive. Tastes differ and it is hard to determine what is deemed ‘beautiful’, but some things can be said about it. 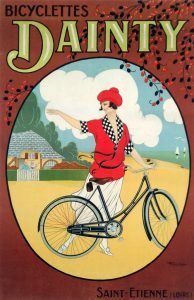 Posters with elegant women are for instance highly sought after, but also touristic posters and ads for ships and (classic) cars. Fresh and bright colours are often more popular than gloomy monochromatic posters. Posters with a large amount of text, or only text, are worth collecting only if the typography is very special and rare. Now that you know some insights how posters are estimated, you probably want to know what you should do next. 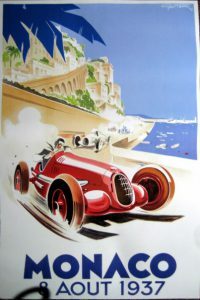 If you have a poster that might be worth something, ask an estimation from MeArto. After the estimation information, you can put the poster on offer at the online auction platform Catawiki. Registration for becoming a seller at Catawiki is for free, so even if your poster isn’t sold for the price you had in mind, you won’t have to pay Catawiki any placing fees. So what are you waiting for, get your poster estimated.